This is a old rare kit,this is a Ed McGinnis Style Superman. DC Comics Mister Miracle Custom Painted Model It stands about 0 1/21 inches tall. I think it was a Silver Surfer kit which somebody modified. There are two holes in the feet for mounting to a base but no base is included. The paint is a little smeared on the back of the head. 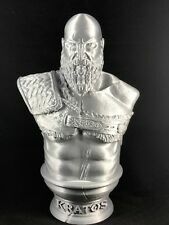 3D Printed Kratos Bust - 9” Tall. Printed in Silver PLA. 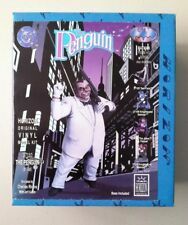 PENGUIN UNBUILT MODEL KIT. DC COMICS UNIVERSE. OPENED BOX, SEALED BAG, INSTRUCTIONS INCLUDED, COMPLETE. The base is detailed as well. This rare resin kit is based on the prototype Aurora model kit that never went into production. The PHANTOM & DEVIL Statue Professionally Built & Painted with Incredible Detail in the paint and sculpt. DC Comics Superhero Metamorpho custom built figure. It stands about 11 inches tall. It feels like it's made of resin. There's a pin on the bottom to attach to a base but no base is included. Excellent condition. This piece is stunning and has that great, long flowing cape and stands 8" tall. Professionally painted by an Award winning make up artist and painter. The details are uncanny. The work is incredible and stands about 6" tall with fantastic detail in both the sculpt and the paint. Professionally painted by an Award winning make up artist and painter. This kit was released by DC Direct, it has been customized with a different head, base and professionally re-painted. Statue has a terrific sculpt, classic pose and fantastic detail and paint. The likeness to Chris Reeve is amazing, as was his portrayal of the iconic Superman. This one will be the center piece of any collection, see the photos. Professionally built and painted by an Award Winning Make Up Artist and Painter. The details are uncanny. The work is incredible and stands about 6 3/4" tall. Professionally painted by an Award winning make up artist and painter. The details are uncanny. The Joker diorama is a very rare piece. You can see the. syringe in the Joker's hand as well. The Joker's suit has a silk look to make him really stand out on the base. Base is 9"x7" and the Joker stands 10-3/4" tall. Superman stands 14 1/2" tall. Professionally painted by an Award winning make up artist and painter. This one is never available, one of the best pieces out there. The work is incredible with fantastic detail in both the sculpt and the paint. © 2016 Dauntless Hobbies. This set includes 3 sheet of paint masks and instructions. Commodity Attribute: Finished Goods. Material: PVC. Scale: 1/6. Version Type: First Edition. Age Range: > 8 years old. Mfg Series Number: Assembly/Assembling. By Animation Source: Western Animiation. Item Type: Model. The work is incredible and stands about 6 1/2" tall with fantastic detail in both the sculpt and the paint. The details are uncanny. 3D Printed Thanos Bust - 4.5" x 3.5" Tall (Blue PLA). Condition is New. Shipped with USPS First Class Package. The likeness and detail are very impressive, gorgeous sculpt and amazing paint. The statue is quite heavy and very solid.I have taken photos from several angles. Professionally painted by an Award winning make up artist and painter. Superman would stand 15-16" tall if standing upright. The statue is quite heavy and very solid.I have taken photos from several angles. Professionally painted by an Award winning make up artist and painter. Sh e has incredible detail in the sculpt and the paint and stands about 9 1/2" tall, plus the base. Professionally painted by an Award winning make up artist and painter.